Review: "Mollo/Martin: The Third Cage" - Sea of Tranquility - The Web Destination for Progressive Music! 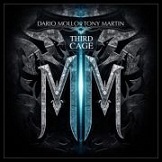 Former Black Sabbath vocalist Tony Martin, who fronted the band during the late 80's and into the early 90's, has been all too quiet in recent years but he's back for another round with hotshot Italian guitarist Dario Mollo, this one called The Third Cage on Frontiers Records. Mollo you might recall did some recordings with Glenn Hughes under the Voodoo Hill banner a few years back. Here on The Third Cage, the guitarist handles most of the instrumentation, with some help from drummer Roberto Gualdi, additional bass & keyboards from Fulvio Gaslini, Dario Patti, and Brian War, and of course the commanding vocal pipes of Martin. Much of what you'll hear on The Third Cage is high quality heavy metal, hard rock, and melodic rock, with Mello's superb guitar work and Martin's soaring vocals leading the charge. "Wicked Word" could have easily been a leftover from Sabbath's Cross Purposes or Tyr, and "Oh My Soul" is firmly in the Rainbow/Deep Purple mode with Mollo tossing in some splendid Blackmore styled riffs and solos to go along with Martin's powerful vocal. "One of the Few" and "Cirque du Freak" are catchy 80's styled melodic rock pieces, and "Still in Love With You" is a heavy, epic number that recalls the majesty of Dio era Rainbow as well as the stomp of 80's Black Sabbath. Other highlights include the melodic heavy rocker "Wardance", which has some great symphonic keyboards to go along with the beefy riffs, the Dokken-ish "Don't Know What It Is About You", and the raucous guitar frenzy that is "Blind Fury". Tasty stuff from start to finish, The Third Cage is a fun and varied affair that has a little something for everyone. Tony Martin shows that he's still a vocal force to be reckoned with (though he's starting to look a little like former Deep Purple keyboard master Jon Lord!) and Mollo is certainly an underrated player in hard rock circles. Highly recommended. Tony Martin is becoming as ubiquitous a vocalist as Jeff Scott Soto, appearing on albums by at least a dozen artists since the mid-Eighties. Best known for his stint fronting Black Sabbath, the English-born Martin sings from the gut, and he pours his soul into nearly every one of the 10 songs on the third Mollo/Martin project, the lackluster-titled The Third Cage. Together with Italian multi-instrumentalist and producer Dario Mollo and a few studio musicians, Martin delivers plenty of Sabbath comparisons. But what strikes me about The Third Cage � beyond what my SoT colleagues have already stated � is just how contemporary this thing sounds despite the obvious old-school rock and metal references. In fact, songs such as "Wardance" and "Blind Fury" remind me of the modern-day direction Winger has taken (especially on 2009's Karma). The dark ballad "Oh My Soul," the Whitesnake-y "Still in Love With You" and the dare-I-say poppy "One of the Few" provide plenty of variety, and the chorus of the thick-groovin' "Cirque du Freak" has to rank among the best in the Mollo/Martin catalog. Only the finale, "Violet Moon," disappoints � building to a point where you think it should just explode. Alas, it never quite does. Following Metal luminaries such as Ozzy Osbourne, Ronnie James Dio, Ian Gillan, Glenn Hughes and Ray Gillen in Black Sabbath undoubtedly led to vocalist Tony Martin being compared to some of the best and most recognisable voices in the business. Although many dispute it, Martin actually stood up extremely well in that company and his five albums with the band are much better than they are given credit for. Since his tenure with Mr. Iommi, Martin has recorded sporadically, with some of his best output coming from his two previous efforts with Italian guitarist Dario Mollo (who has also worked with Glenn Hughes and Graham Bonnet), with their Classic Rock approach hitting home hard on both The Cage and The Cage 2 albums. No more inspiringly titled The Third Cage picks up from where its predecessors left off, with striking riffs and Martin's strong, muscular vocals sitting proudly out front of an album that veers from Rainbow to latter day Sabbath, by way of some more commercially astute Rock. Martin has lost none of the potency in his vocal delivery, something that is evident throughout the whole of The Third Cage, with opener "Wicked World" immediately giving him the opportunity to show off an impressively wide and confident range. Mollo however is never outdone, with the powerful riffs and searing solos cutting through solid bass and drum work from Fulvio Gaslini and Roberto Gauldi with forceful precision. The likes of "Oh My Soul", "Cirque Du Freak" or "Wardance" could easily have come from Martin's time with Sabbath, with the slow, yet melodic guitar patterns providing a meaty, doomlike, if commercial-ish groove - thanks to the introduction of keyboards to the mix. However the scope of the album is also opened up by slightly more adventurous tracks such as "Still In Love With You", which brings Blackmore like Eastern themes to another solid guitar workout, "One Of The Few", which almost falls into Melodic Rock territory, what with its bouncy keyboard stabs and upbeat outlook, while the wonderful eight minute long "Violet Moon" brings the album to a close in epic fashion and is an undoubted highlight. If you've let the first two albums from Mollo/Martin slip under your radar, then The Third Cage is an excellent opportunity to discover a true Rock beast of a band. Excellently produced and wonderfully mixed, Dario Mollo and Tony Martin have come up with another selection of top notch Heavy Classic Rock with a melodic twist that convinces from start to finish.